A delegation headed by Prof. Dr. Ghazala Yasmeen, Vice Chancellor and faculty members from Women University Mardan visited the Central Library IIUI. The delegation was received by the Mr. Sher Nowrooz Khan, Chief Librarian of the University and was given a detailed briefing about the Central Library. The delegation visited different sections of the Library including circulation services, technical section, periodical section, general collection, book bank, reference collection, United Nations Information Resource Centre and Lincoln corner and video conference facility. The participants showed keen interest in the library security system and its working, CCTV surveillance system, computer labs and integrated library system used for different library operations. A three days long annual book fair was organized at the Students’ Activity Centre, International Islamic University, Islamabad (IIUI) as a part of 27th Cultural Week IIUI. The inauguration ceremony of the Book Fair was held on 28th April 2018 and the chief guest of the ceremony was Dr. Ahmed Yousif Al-Draiweesh, the worthy President IIUI. Deans, Directors, HODs, faculty members, university staff, Chief Librarian, library staff and a large number of students were also present on inaugural ceremony. In the book fair about 41 renowned publishers from across the country have set their book stalls. Students and faculty members showed great interest in books on display. Faculty members selected books relevant to their subjects and found it easy to select books, available in the Book Fair, from renowned scholars and publishers. A Hands-on training on IEEE xplore along with other digital resources was conducted in Central Library. Mr. M. Rashid Pervez, Senior Manager Admin & Trainings from A&J Def Tek Consultants conducted the training. Faculty members, MS, PhD and final year students of BS level from female campus attended the training. How to access digital library and resources available to IIU. How to retrieve your relevant information. The attendees to the training were also given prizes and freebies through lucky draw. 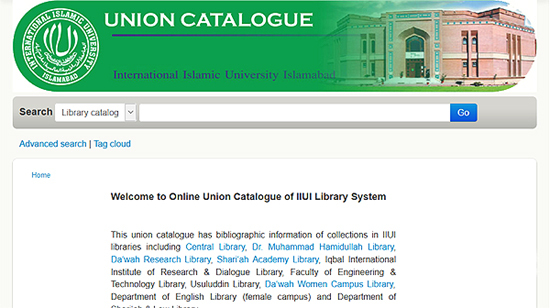 The Central Library of International Islamic University, Islamabad has launched Online Union Catalogue in its all libraries system. This union catalogue has bibliographic information of collections in IIUI libraries including Central Library, Dr. Muhammad Hamidullah Library, Da’wah Research Library, Shari’ah Academy Library, Iqbal International Institute of Research & Dialogue Library, Faculty of Engineering & Technology Library, Usuluddin Library, Da’wah Women Campus Library, Department of English Library (female campus) and Department of Shari’ah & Law Library. This union catalogue contains information about all the holdings of the IIUI libraries and will help faculty members, students and staff to check the information of available resources in any of these libraries as books, theses, reference material including encyclopedias, dictionaries, maps, almanacs, etc. This innovative system will save the researcher’s valuable time by searching the library items at one place rather than searching an item in every library’s catalogue. The catalogue contains bibliographic information of library collections including title, author(s)/editor(s), call number, subject(s), imprint, etc. This is first ever Union Catalogue of the IIU libraries. A Hands-on training on HEC Digital Library was conducted at Central Library with the collaboration of Higher Education Commission, Pakistan. 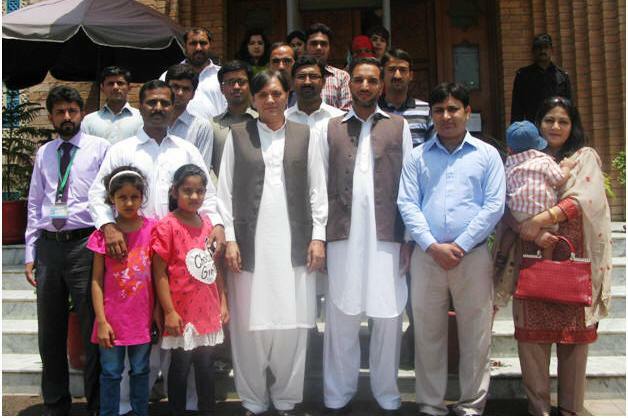 Mr. M. Rashid Pervez, Senior Manager Admin & Trainings from AJ A&J Def Tek Consultants conducted the training. Library professional staff from Central Library, Dr Muhammd Hamidullah Library, Da’wah Research Library and Shariah Academy Library attended the training. The main contents of the training included methodologies to access digital library and process to retrieve relevant information. The training session also covered accessing, browsing, searching and filtering search results in e-brary, Science Direct and Pro-Quest Dissertations & Theses. The resource person spoke on methods to read on books online, download, bookmarking, while download chapters both from desktop computers and hand held devices were explored. The participants termed the training as a valuable activity and said it will be helpful in finding the specific required information by the library users swiftly. Participants took part in the 2nd ScienceDirect Quiz “Quiz 4 Science Pakistan”. Freebies and prizes were distributed through Lucky Draw for the attendees of training. Dr Muhammad Hamidullah Library, Islamic Research Institute in collaboration with Central Library, IIUI organized a two-day library mounted books and photographs exhibition at Central Library to commemorate Iqbal Day. 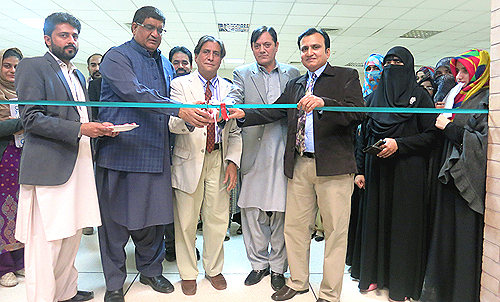 Worthy Vice President (Academics) Dr. Muhammad Bashir Khan inaugurated the exhibition, which was held on Wednesday, November 23, 2016. 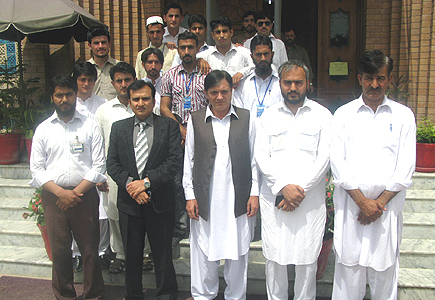 Director IRI Dr. Zia ul Haq and Chief Librarian Sher Nowrooz Khan were also present in the ceremony. Dr. Zia-ul-Haq addressed the participants and highlighted different aspects of the Allama Iqbal’s philosophy and poetry. He said that Allama Iqbal not became poet just to write poetry but he used poetry as a medium for dissemination of his ideas and philosophy to awake muslims of subcontinent and ummah. He said that the iqbal’s philosophy is like the soul for the nation and whenever Pakistan becomes super power of the world the base will be the iqbal’s philosophy. Prof. Dr. M. Bashir Khan also shared his views with the students. He said that unthankful nations would never grow in the world. We should remember our ancestors and read about them. We should read the poetry of Allama Iqbal. He shared the quotes of Quaid-i-Azam and Maulana Maududui about Allama Iqbal. Quad-i-Azam said that Allama Iqbal was my role model while maulana maududi said that Iqbal spread islam through his poetry. He said that students should read writings of Iqbal to enlightened their inside. He also emphasized on the importance of libraries for the nation. A three days long annual book fair was organized at the Students’ Activity Centre, International Islamic University, Islamabad (IIUI). The Book Fair was inaugurated by Dr. Ahmed Yousif Al-Draiweesh, President IIUI, while on the occasion, faculty members, deans, directors, Mr. Sher Nowroz Khan Chief Librarian and a large number of students were also present on inaugural ceremony. In the book fair about 50 renowned publishers from across the country have set their book stalls and books are being sold with 50 % discount. The aim to organize book fair is to promote reading culture among the students. Speaking on the occasion, Dr. Al-Draiweesh said that knowledge beautifies and raises social, cultural and intellectual level and the book leads to ascension of humanity. “Quran and Sunnah are the basic sources of all the branches of knowledge and seeking knowledge is obligatory for all Muslims irrespective of gender”. Dr. Al-Draiweesh added. President IIU further said that books play important role in developing and reshaping the societal norms and cultural values; books are the most important source to disseminate Islam’s message to the world. Dr. Al-Draiweesh appreciated the efforts of organizers to hold book fair and hoped that this tradition will continue in the university with visible promotion. Qur’an Khwani and Dua for the departed colleagues and relatives of the library staff was arranged in the Central Library of International Islamic University, Islamabad (IIUI). The library staff and some employees of the university participated in Qur’an Khwani and Dua and prayed to Almighty Allah for granting eternal peace to the souls of deceased employees and relatives of the library staff. A 20 member delegation comprising teachers and students from Department of Library and Information Science, Islamia University Bahawalpur, led by Mr. Aamir Rasul, Assistant Professor, visited the Central Library, International Islamic University Islamabad (IIUI). The delegation was received by the staff members of Central Library IIUI and was given a detailed briefing about the Central Library, IIUI by Principal Librarian Mr. Muhammad Zulqarnain Akhtar. He also threw light on the resources, services and overall Library System IIUI. The participants praised the services, resources and infrastructure of the library. They were pleased to know about digitization of theses and article indexing projects. The participants especially commended the peaceful and research-oriented environment in the library. 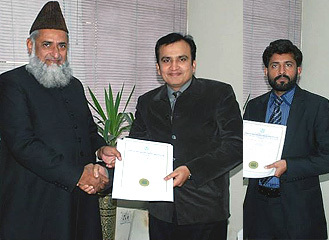 A series of training programs for the professionals of educational institutions organized by Institute of Professional Development (IPD) of International Islamic University Islamabad (IIUI). The series of training programs was titled as “Indigenous on-Campus Training under the Modern University Governance Program” which was organized by the institute, in collaboration with Higher Education Commission, Pakistan (HEC). Training sessions were joined by the professionals from Central Library, Dr. Muhammad Hamidullah, Dawah and Shariah Academy libraries. During training, they attended lectures regarding stress management, time managements and many other vital topics. Concluding ceremony was presided over by President IIUI Dr. Ahmed Yousif Al-Draiweesh, while it was also attended by Khwaja Zahid Hussain, Advisor Finance HEC, Project Director IPD Dr. Saeed ul Hassan Chishti, Program Coordinator Kashif Sohail Malik and Training Management Specialist IPD Saneeha Khalid. A 20-member group of students from Department of English of Government Post Graduate College Mardan visited International Islamic University Islamabad’s new campus. This educational visit of the students of BS, Department of English of Government Post Graduate College Mardan visited the Central Library of of university with their teachers. The participants was welcomed by the Manager IRC Muhammad A. Ganaee and a tour of the Central Library was given to them. They were briefed about different sections of the Library including circulation services, technical section, periodical section, general collection, book bank, reference collection, United Nations Information Resource Centre and Lincoln corner. The participants showed keen interest in the library security system and its working, CCTV surveillance system, computer labs and integrated library system used for different library operations. The students and teachers were amazed to see the live demo of video conferencing and appraised the services provided by the library to its members. A training was held in the Pakistan Manpower Institute, which works under the Ministry of Education, Trainings and Standards in Higher Education, Pakistan on “Strategic Vision”. This was a very valuable two-day training attended by Muhammad A. Ganaee, Manager IRC and Iftikhar Ahmed, Librarian, Central Library. The workshop was a part of series of training workshops arranged for in-service employees by the ministry. It is worth of mentioning that the training gave an overview of strategic vision, organizational vision and mission, developing goals and decision making. A one day Koha training workshop was organized by the Central Library of International Islamic University Islamabad (IIUI) on Tuesday 11th November 2014. All professional and para-professional staff, both male and female, working on Koha in different sections of the library participated in the workshop, including library internees. Library took the bold step and decided to use Koha, which was a free open source integrated library system, resulted in saving valuable financial resources of the university. It is used world-wide by public, academic and special libraries. In the opening session of the workshop, Muhammad Zulqarnain Akhtar, Principal librarian gave emphasis on enhancing skills in using this software to it maximum. He himself participated in the first session and gave valuable suggestions, during the cataloging module. This workshop was a part of series of workshops being arranged for the library professionals of the university. It provided hands-on exercise for Koha configuration, which was essential for the senior library staff to become system superusers. Other sessions provided guidance to increase the skills to manage Koha for searching, cataloging and patron management. Resource person for the training was Muhammad Abbas Ganaee, Manager IRC who trained the participants in different modules of Koha.